Plenty of tough choices to be made on the trade front in the Atlantic Division, which contains a mix of contenders, bubble teams and basement dwellers. Here are the latest rumours for all 8 teams. Boston Bruins - Rumours suggest the Bruins have looked into acquiring Kevin Shattenkirk, Jacob Trouba, Gabriel Landeskog and Dennis Wideman. Teams continue to call on Ryan Spooner and to some extent prospect goalie Malcolm Subban. Buffalo Sabres - If they sell, they've got plenty of assets to dangle. Teams will call on pending UFAs Brian Gionta, Cody Franson and Dmitry Kulikov. 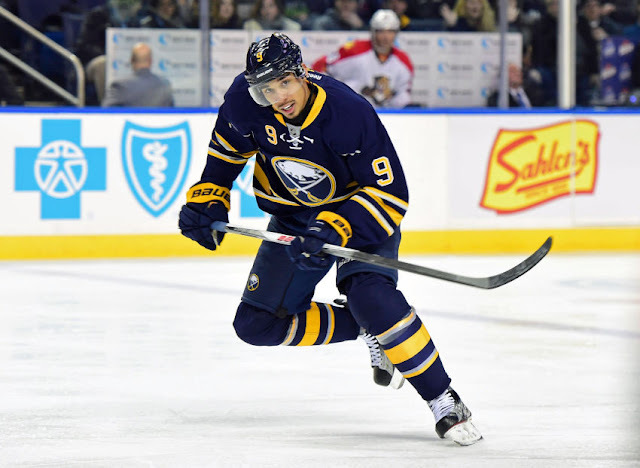 Evander Kane has seen his name in the rumour mill dating back to the summer. Detroit Red Wings - For the first time in decades, this is likely going to be a selling deadline for the Wings franchise. Pending UFAs Thomas Vanek, Brendan Smith and Steve Ott will generate plenty of interest, and teams have begun calling on Gustav Nyquist and Tomas Tatar as well. Florida Panthers - This season hasn't gone as well as the Panthers might have hoped, and that means they're sellers in part. But they're also willing to "buy" in the sense that they have the cap space to take on salary for picks and prospects. They are rumoured to have some level of interest in Tomas Jurco. Montreal Canadiens - The Habs have big hopes for this season, and could make a few large moves at this year's deadline. They have expressed interest in Duchene, Landeskog, Hanzal, Alex Burrows and Patrik Berglund, among other names. Rumours have cropped up around Tomas Plekanec and Alex Galchenyuk, although it's hard to imagine a scenario where the Habs trade either during the season. Ottawa Senators - Have called on an Avs trio: Duchene, Landeskog and Beauchemin, but don't seem to be a frontrunner for the former two. They will hope to move Andrew Hammond as they move towards an Anderson-Condon tandem. Teams continue to call on Curtis Lazar. Tampa Bay Lightning - Desperately need to improve on defense, and have looked at Shattenkirk as one possibility. Teams are calling on Ben Bishop, though the offers haven't been nearly good enough for Yzerman to pull the trigger. Tyler Johnson, Ryan Callahan and Valtteri Filppula's names are out there as well. Toronto Maple Leafs - Not in full buy mode, but are rumoured to be somewhat interested in Shattenkirk and other elite and/or young defensemen. Brian Boyle is a rumoured target to help shore up the Leafs bottom six. Teams are calling on Roman Polak and Matt Hunwick. The Leafs may move one or both regardless of where the team sits in the standings. James van Riemsdyk is generating some trade buzz, but he isn't likely moved in-season. The Leafs have a lot of cap space to play with and could turn out to be one of the busier teams this trade season.